I tend to forget Nintendo is a Japanese company. With all the popular franchises like Kirby, Zelda, Metroid, Ninja Gaiden, and Mario having been ported to the US, we miss the hidden jewels like Fire Emblem that have never made their way here. But now Nintendo has released US versions of two Fire Emblem games for Game Boy Advance. And they're good. Fire Emblem hasn't changed a lot since the early days. The original 1990 NES game is a mix of RPG and turn based strategy. You read some story, then enter into a tactical battle where you move your little guys on the map to attack their guys, then read some more story. The fighting is entirely algorithmic; your choice is in how you manoeuvre. What's appealing is that you have enough units to really feel like you're managing a battle, while still having few enough that they have individual identity. It's surprisingly complex, and the entire franchise looks good. It's too bad Nintendo took so long to bring these games to the US. But between the popularity of Final Fantasy-style RPGs and Advance Wars-style strategy games it's now clear there's a market here. Normally I find these kinds of games boring, too much reading and not enough playing. But on a handheld it has a nice rhythm. One of my favourite writers about games, Greg Costikyan, has just published slides from his latest talk (PDF version). The slides are worth a look, Greg does a great job arguing that the current increasing cost of game development is going to kill creativity and we need an alternative distribution channel to save the industry. Greg argues the long term game markets is for all ages, not just young people. What an opportunity, both creatively and financially! Greg's post also reminds me of my frustration that games are too long. A movie is $10 for 2 hours of fun. A game is $50 for (in theory) 30+ hours of fun. But most people I know get bored of games in less than 20 hours, the rest is wasted. I'd rather games were shorter, cheaper, and more varied. But the economics of the industry make that tough. The $50 price point is fixed by development costs, and they don't get much cheaper for a shorter game. And if the consumer pays $50 they expect 30+ hours of gameplay. So we're stuck with an industry that makes long, expensive games. Sitting at home, eating a chili dog, drinking a couple of beers, and watching Repo Man. Life really doesn't get much better. Photoshop's JPEG code is bad software. I'm a longtime Gimp user. But lately I've been playing around with RAW images and colour profiles, and Gimp does badly with those. So I'm giving Photoshop Elements a free trial. I mostly like it, but its JPEG saving is insane. Not only does Photoshop not use the same 0-100 quality scale that all the other tools I know use, they have two different ways to save JPEG, with different scales. Neither work right. I have a picture, a portrait from my Digital Rebel XT. It's 3456x2304 and about 9 megs as a PNG. If I convert it to jpeg using cjpeg -q 75, the baseline for JPEG creation, it's a 580k file. OK, all well and good. If I try to use Photoshop's "Save for Web", the quality slider lets me choose 0–100. I set it to 75 and the resulting image is 1.4 megs! That's about like a cjpeg 92. OK, so they have a different scale. Fine. But no matter what I do I can't get a 580k file out of the tool. A quality of 50 yields 554k, a quality of 51 yields 677k. Why the giant jump? Shifts to 49 or 52 don't yield nearly as much a difference. To make matters worse, "Save for Web" leaves out all your EXIF data. And the tool gives you dire warnings about 8 megapixels being too big an image. Um, right. The normal "Save as.." in Photoshop is a bit better. The JPEG option has a quality slider, too, but this one goes from 0–12. Because you know, 12 is better than 10. Generating a 580k file is still impossible. Given there's only 12 quality steps that's not too surprising. But there's still a giant jump: quality 8 is 607k, quality 7 is 400k. What's going on? I guess I shouldn't be this fiddly about JPEG settings, but I'm truly mystified as to what Photoshop is doing. cjpeg gives a nice smooth quality/size tradeoff with lots of fine grained adjustments right in the middle of the sweet spot. Photoshop seems to make it impossible to control the same tradeoff. No wonder so many online images are poorly compressed. Scientific American used to be a great magazine, but a few years back they made an editorial decision to become less nerdy, more sensational, less interesting. Technology Review has somewhat filled the gap for me, although the new editorial policy is way more business oriented than I would prefer. The June 2005 issue had a few interesting bits in it. Larry Lessig has a good free culture essay. And Howard Anderson, of Battery Ventures, has a somewhat shocking essay on why he no longer wants to be a VC. In HKEY_Current_User/Control Panel/Input Method, create a key "EnableHexNumpad" and set the value to REG_SZ, "1". Do it manually, or use this registry file. Hold down alt, type numpad +, type a 4 hex digit code (263a, 0041, whatever), release alt. Full disclosure: when I rebooted Norton AntiVirus failed to start. It's hard to believe this had anything to do with enabling Unicode input. But if the idea of breaking your Windows box scares you, maybe you want to stay away. Auto-Protect didn't start with error (4002,517), reinstalling shared files fixed it. Isn't Windows fun? I've been a happy user of the Ethnologue database for years. It lists all languages of the world in a simple database form. Just yesterday I did a search for Malagasy ethnologue to learn that Malagasy is a language of Madagascar. It's a lot of fun to browse, skipping from country to language to country as you follow immigration patterns. The New York Times today has an interesting article about Ethnologue, on the occasion of the publication of the new version of the database. I had no idea the database was developed by Christian missionaries! In retrospect that makes perfect sense, just like LDS maintaining the best geneaology data. Sometimes religious fervour has practical benefits. I also didn't know Ethnologue is the source for the three letter language codes we use in internationalized software, soon to be ISO 639-3. 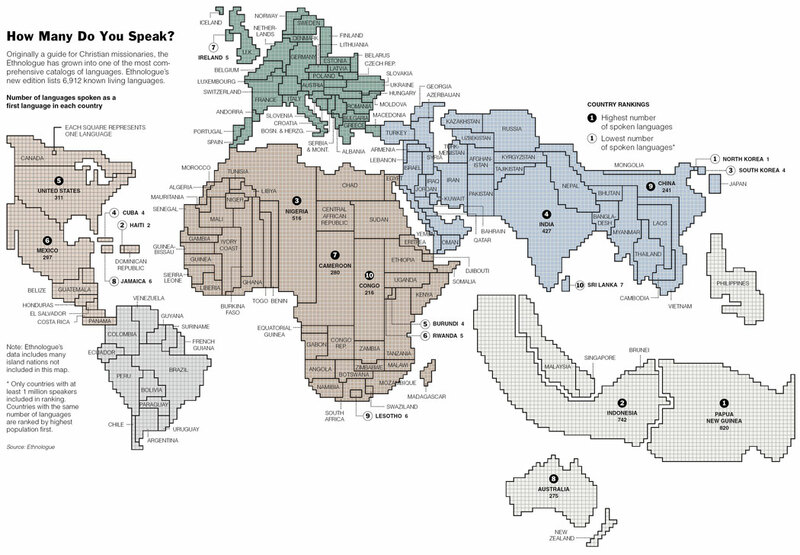 Don't miss the NYT's visualization of language distribution. I love the NYT graphics; this one is by David Constantine. Good news! We've just lowered the price of "Harry Potter and the Half-Blood Prince" from $17.99 to $16.99. You don't need to do anything to get the lower price--we are automatically issuing you a $1.00 refund. A retroactive discount? That's a clever way to build business. A quick search reveals Amazon is now undercutting the other major stores on price. In related news, you can steal the new book electronically if you like reading OCRed pages. A torrent of an audiobook version (lovingly read by a robot, one presumes) has 2000+ downloaders. Hikaru No Go is a great Japanese manga. It's the story of an elementary school boy who discovers an ancient Go board inhabited by the spirit of an expert Go player from Japan's feudal past. The comic deftly tells stories that combine the pressures of being a young kid, the nuances of the game of Go, and anime-style epic battles. It makes playing Go seem incredibly cool. The art is awesome: see some samples here. The English editions (published by Shonen Jump) are well done. My eight year old nephew just devoured one in a day. Amazon makes it difficult to find them. Here's a list of the English editions: Hikaru No Go Vol 1, Vol 2, Vol 3, Vol 4. WarioWare for the Gameboy was a breakthrough game combining insane graphic design, simple gameplay, and frenetic pacing to make a fun game. The follow-on WarioWare: Twisted is just as great. The novelty in Twisted is a motion sensor in the cart. To make things happen in the game you spin your Gameboy around. It's true that this basically turns your Gameboy into an Atari 2600 paddle, but it really works. The rumble pack's tactile feedback adds a lot, little clicks and thumps that let you feel your turning. My favourite minigame so far is a balance game where you tilt the Gameboy to keep the umbrella balanced on the end of your finger. The game starts with dire warnings to spin only your Gameboy, not yourself, lest you get sick. The warning is so detailed and over the top the first thing I wanted to do was stand up and try spinning myself around. The best part of my trip to France last month was poking around the Southwest. Carcassonne, the Lot, Perigord, the Dordogne. Beautiful, restful, lots of interesting little towns. Below is some of the nice things we found. See also my notes on restaurants from the trip and my photos.